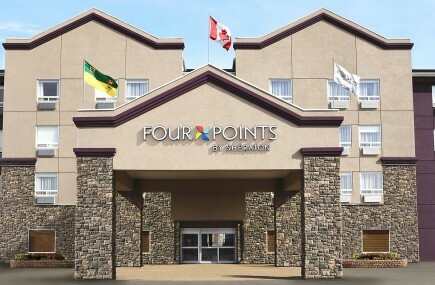 Four Points by Sheraton - Saskatoon, SK - VJ Management Inc. Welcome to the Four Points by Sheraton Saskatoon. We are located near Prairieland Park, the University of Saskatchewan, Jemini Ice Sports, and all major highways in and out of the city, including Highways 11 and 16. Leave some free time to enjoy area attractions such as the Dakota Dunes Casino, the Willows Golf and Country Club, and Mendel Art Gallery. Saskatoon John G. Diefenbaker International Airport is just 15 minutes away. We’ve Got Bells & Whistles, Too. Every aspect of our hotel was designed with you in mind. Great first impressions start with our welcoming and energetic lobby. Plus, the hotel also offers a Family Room where you can relax or surf the Internet. The feeling continues in the restaurant, which serves breakfast, lunch, and dinner in a friendly atmosphere. If business brings you to the area, you will appreciate our fully-equipped business center with state-of-the-art technology and our 2,000 square feet of flexible meeting space. Enjoy our indoor pool and health club to help you stay fit and refreshed. Simple Comforts. Our 119 spacious guest rooms offer the generous benefits of a master bedroom and oversized bath, as well as cable, a spacious work area, a refrigerator, and a microwave. Little things in life make a big difference. Like our Simple Pleasures(SM). Get a great night’s sleep in the Four Points by Sheraton Four Comfort Bed™, refresh with free bottled water daily, and keep in touch with free High Speed Internet Access. Kick back with a beer from our collection of the world’s Best Brews™ or catch up on some reading over a hot, fresh cup of coffee.